Kristen Bell (Frozen, TV's "The Good Place") will narrate the latest IMAX documentary adventure Pandas, a heartwarming global story about reintroducing captive born pandas to the wild. The film will be released in select IMAX® and IMAX® 3D theatres starting April 6, 2018. Kristen Bell. "Pandas not only spotlights the important work being done to protect these beloved and ridiculously cute animals, but it provides us with inspiration and hope and showcases the great things we can achieve when we work together." Kristen Bell join the IMAX family to narrate Pandas. We can't wait to share this heartfelt journey that will transport IMAX audiences to the mountains of Sichuan in China and spotlight the incredible steps scientists are taking to protect and reintroduce these magnificent and adorable pandas into the wild." Jeff Goldstein, President Domestic Distribution, Warner Bros. Pictures, said, "We are so pleased to continue the tradition of bringing these wonderful IMAX adventures to families. We're proud to add Pandas to our slate and to give people an opportunity to see these amazing animals as never before." Kristen Bell onboard to guide this one-of-a-kind IMAX adventure." Kathryn Hahn. The film is a sequel to 2016's Bad Moms, the first STX film to gross over $100 million domestically. Sarah Marshall, Pulse, Serious Moonlight and David Mamet's Spartan. Her television credits include "
Laura Linney. Her Off-Broadway credits include "Reefer Madness" and "A Little Night Music." Kristen Bell ("Frozen," TV's "The Good Place"). Qian Qian on an exciting new adventure into the mountains of Sichuan as she experiences nature for the first time and discovers her wild side. Drew Fellman, the filmmakers behind "Born to be Wild" and "Island of Lemurs: Madagascar," directed the film, which Fellman wrote and produced, with Douglas as director of photography. IMAX Entertainment presents, in association with IMAX Documentary Films Capital, Jin Yi Culture Investment (HK) and Panda Productions, "Pandas." This film, distributed by Warner Bros. Pictures and IMAX, will be released in select IMAX® and IMAX® 3D theaters starting April 6, 2018. 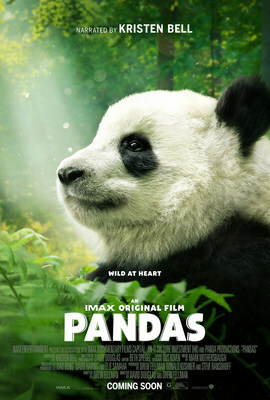 The film is rated G.
For the new trailer, downloadable photos and general press information, please visit: www.IMAX.com/pandas and https://mediapass.warnerbros.com.